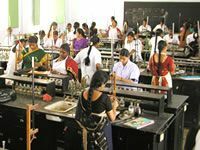 The PSGR Krishnammal College for Women, established in 1963, is an institution dedicated to women seeking higher learning at the Graduate, Post Graduate and Doctoral levels. This ISO 9001:2008 certified college is autonomous, affiliated to Bharathiar University and Re-accredited by NAAC with A-GRADE rating. It offers over 35 UG and PG programmes. The college has all modern educational infrastructure and facilities including a large library with over 50,000 volumes. The college campus, clean & green, has multistoried buildings with spacious, bright, well-ventilated classrooms. The science and computer laboratories are well–equipped with state-of-the-art infrastructure.